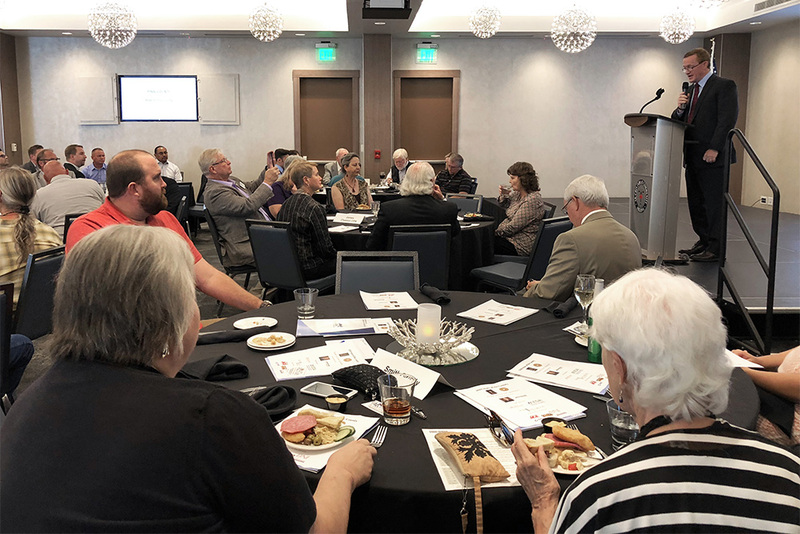 The Maricopa Chamber of Commerce hosted its first State of the County address Thursday evening. Former city Mayor and current Pinal County Supervisor Anthony Smith led the conversation May 18 inside Elements Event Center. 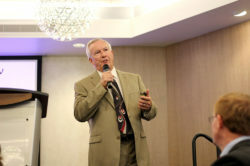 Smith touted Pinal’s progress since the economic downturn at the beginning of the last decade. “We are the first county to recover all the jobs that were lost during the recession,” Smith said. Pinal’s unemployment rate as the recession peaked was higher than 11 percent. It’s now 4.6 percent, according to Smith. 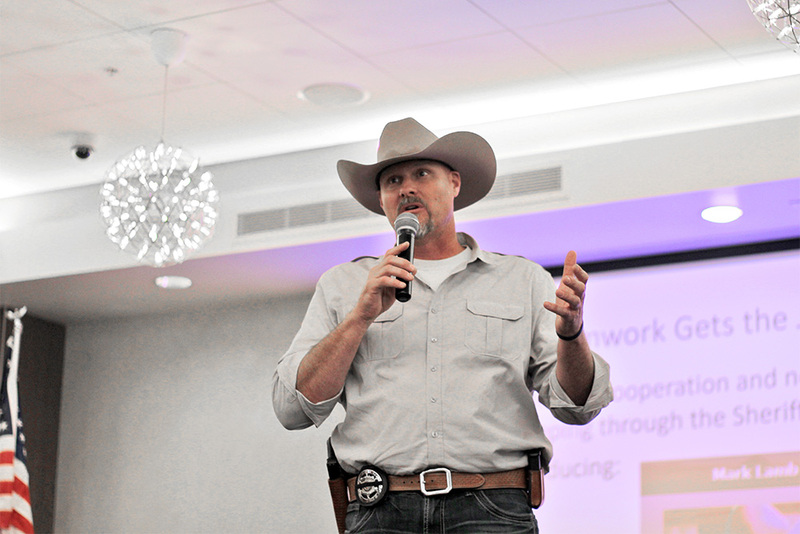 “That basically means everybody who wants a job, has a job,” Smith said. Pinal tops the state in growth at 14.49 percent. Maricopa County is second. However, the rapid development brings to the county a fair share of challenges. Smith said the county has included goals in its strategic plan to lessen tax burdens on residents. By 2021, the goal is to have the property tax rate reduced to 3.75 percent. Smith said property valuations and state tax revenues are growing. The biggest slice in the county’s budget, 62 percent of the pie, goes to law enforcement, the adult detention center and the judicial system. Pinal County Sherriff Mark Lamb said since being elected in 2016, the county jail population has decreased by nearly 200 prisoners. Smith talked about problems the county plans to address in the Maricopa area, including State Route 347. The solution in Smith’s eyes was, of course, last year’s two, successful RTA ballot initiatives that are meant to improve roadways across the county. 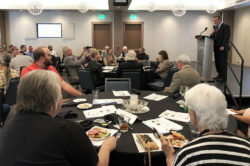 Smith often called upon the county’s “brain trust” to speak to the work county employees are doing to increase its job prospects, tourism and big business. 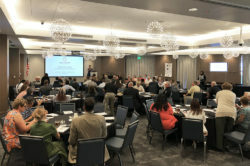 Those appearances featured presentations from County Public Works Director Louis Anderson, County Manager Greg Stanley, Economic Development Program Manager Tim Kanavel and Joel Millman, Workforce Development Program Management for Arizona@Work Pinal County. 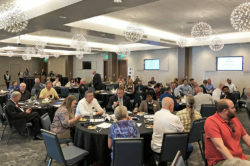 A glimpse into Pinal’s ideal future included road improvements, solving chronic flooding issues, reversing the exodus of workers outside the county and local job creation. Arizona House Rep. Vince Leach (R-District 11), Mayor Christian Price, Maricopa Justice of the Peace Lyle Riggs, Constable Bret Roberts and city council members also attended the event. 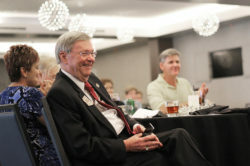 Smith honored for service as president of County Supervisors Assoc.